There are 14 graves listed in the Commonwealth War Graves Commission register in Herrington (St. Cuthbert's) Churchyard. The burials are for both the First and Second World Wars, - 7 for the First World War and 7 for the Second World War. 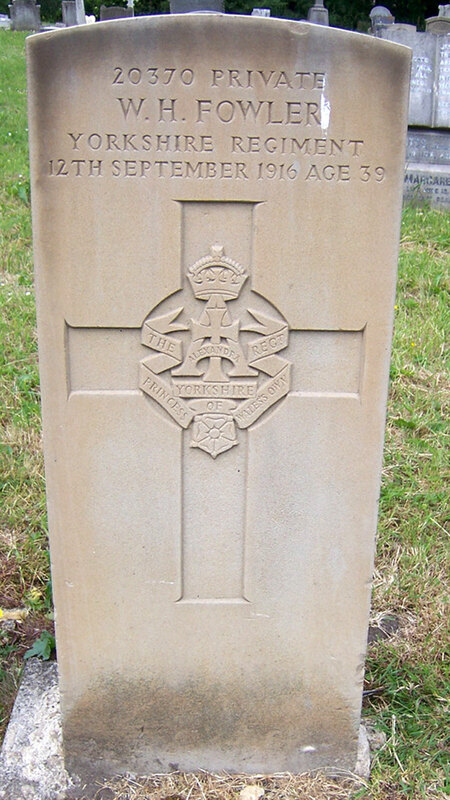 Of the First World War graves, two are for men of the Yorkshire Regiment. There are no photographs of the churchyard itself (the church, St. Cuthbert's, was demolished some time ago), but there are some photos and details on the website for the Durham Mining Museum. Photographs of the graves of the soldiers of the Yorkshire Regiment have been provided by Norman Cummings (<norman_cummings@hotmail.co.uk>), to whom we are very grateful. Select the thumbnail sized image below of a headstone for a largers sized image to open in a new window. Yorkshire Regiment. 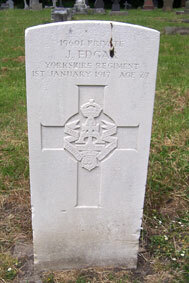 Husband of Elizabeth J. Edgar, of 5 Bridge Row, New Herrington. Died at home 1 January 1917. Aged 27. Enlisted Sunderland, Resided New Herrington. 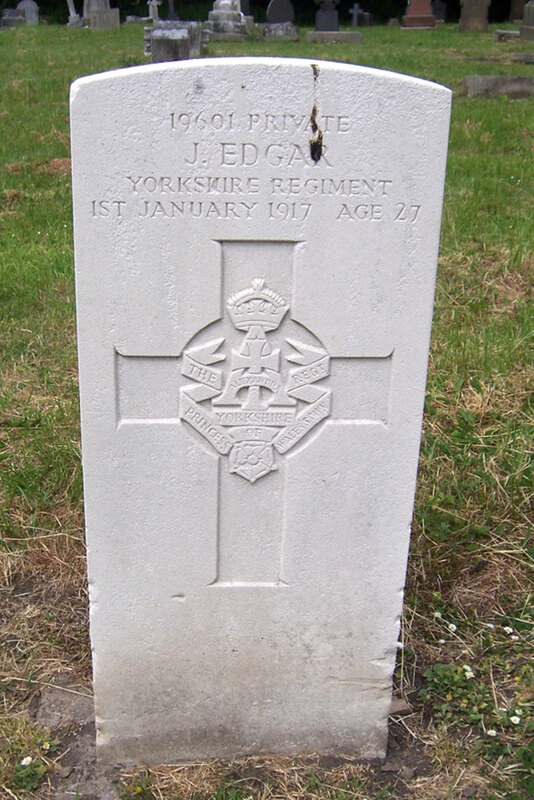 Although not listed in Soldiers Died in the Great War, both the Pension Record and the Service Record exist for Joseph Edger, 1960, of the Yorkshire Regiment. From these, he enlisted on 12 January 1915 but was discharged from active service on medical grounds on 21 June 1915. His records state that "death was due to disease aggravated by active service". Private William Henry Fowler, 20370. 10th Battalion Yorkshire Regiment. Husband of M. A. Gofton (formerly Fowler), of 36, Lanton St., New Herrington. Died at home 12 September 1916. Aged 39. Born Hendon (Durham), Enlisted Shiney Row, Resided Fencehouses.